A few weeks ago, I heard from the folks at Patience Brewster, who asked me to share a holiday memory here on my blog. Check out their website for Christmas ornaments, framed art, stationery, linens, and more. 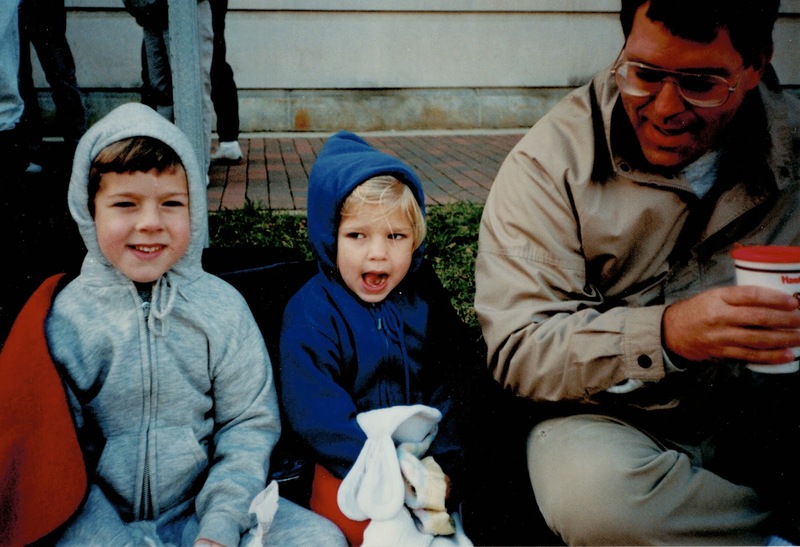 The photo I chose is one of my brother, me, and my dad while waiting to watch the Raleigh Christmas parade. We would get a fast food breakfast, a rare treat (you can see the Hardee's coffee cup in dad's hand), then head downtown for the Christmas parade. I remember it always being sooo cold while we sat and watched the parade. When we were tiny, our parents would tow us in a wagon, and we wrapped up with blankets. What is one of your favorite Christmas traditions or memories?